Windsor, ON – Have you ever found yourself on the outside looking in on the informative and insightful comments section of the Windsor Star? Have you ever wondered how can I contribute to the discussion and social discourse that occurs in the Windsor Star comments section? Well, What’s Up Windsor is here to help you. 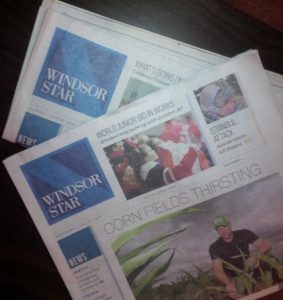 Here are the top ten comments regularly seen on a Windsor Star article’s on-line comments section that you can now use to assist you in joining in on the discussion. Counting down from ten to one here are the most popular comments to leave on a Windsor Star story. 9. How can they print a picture like this? They should think of people’s families. 8. This is all Eddie Francis’ fault. 7. This is all Drew Dilkens’ fault. 6. Honestly, there is nothing funny about that What’s Up Windsor website. 5. Thoughts and prayers to the people involved. 4. That surveillance photo looks familiar. 3. They can pay money for ________ but they can’t repair potholes. 2. I thought those ribbons over Wyandotte Street were a great idea. 1. This is all Eddie Francis and Drew Dilkens’ fault.